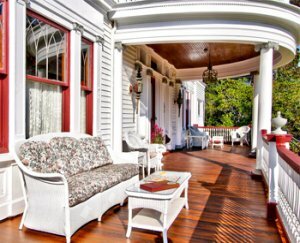 "From the moment you step onto the mahogany-wood porch and through our stately front door, you will be transported to a simpler and more elegant time. 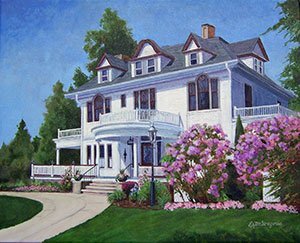 Our home is a Victorian masterpiece, filled with history and character. But don’t let the roaring fireplaces, four-poster beds and delicate table settings fool you. Married to the old-time charm at 600 Main are all the comforts and amenities of today: plush linens, comfy robes, and breakfast and tea menus that would earn stars for South Beach boutique hotels and Manhattan bistros. 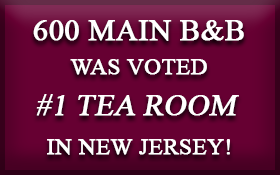 600 Main is a Bed and Breakfast and Victorian Tea Room. Stay overnight or visit for a personalized dining experience. At 600 Main you can celebrate a special event with friends in our garden, or curl up with a good book on a couch in the parlor. Enjoy a wine tasting with other aficionados in the dining room, or sip an iced tea over a game of Scrabble in the library. 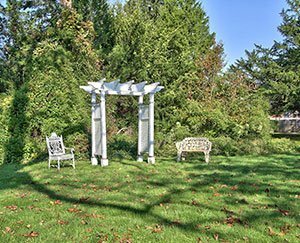 Relax to the gentle melodies from our baby grand in the foyer, or play croquet on the rear lawn. Host a club or business meeting, and reward yourself by staying around for the ambiance and memorable gourmet treats. We are just blocks from downtown Toms River, home to numerous events and activities, as well as minutes from the pristine Jersey Shore. 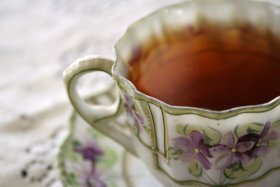 Come to our cozy oasis for pampering, plentiful breakfasts, unique Victorian teas, custom dining events, and a stay you will always remember. Then come back to find out what new events and dining experiences we have planned for your relaxation and entertainment. 600 Main. The luxury of today, the coziness of yesterday. Welcome to our home."